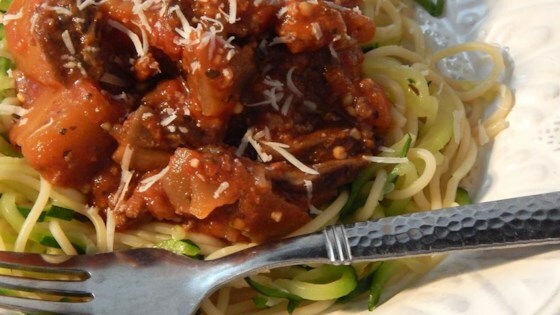 "Italian recipes are my favorite especially when eggplant is included. This is a hearty bolognese and a paleo recipe that is prepared in one pot! You can add any of your favorite vegetables such as peppers or zucchini. You serve over spaghetti squash, zucchini noodles, or your favorite pasta! Enjoy!" Heat 2 tablespoons olive oil in a large Dutch oven over medium heat; cook pork sausage, breaking it onto smaller pieces with a wooden spoon, until browned, about 5 minutes. Add ground beef; cook and stir until beef is browned and crumbly, about 5 minutes. Drain excess fat. Pour remaining olive oil over sausage mixture; add eggplant, onion, garlic, salt, and black pepper. Cook and stir until lightly browned, about 10 minutes. Add mushrooms and continuing cooking until tender, about 5 minutes. Mix crushed tomatoes, diced tomatoes, parsley, oregano, and basil into sausage mixture; bring to a boil. Cover Dutch oven, reduce heat to medium-low, and simmer for 30 minutes. See how to make a truly classic ground beef and tomato sauce. You can make this meatless by omitting the meat and add peppers and zucchini to make this extra hearty. You can also substitute ground pork for the sausage. I love this sauce. The eggplant gives it a nice creamy texture. I usually cut out half of the basil (personal preference) and use poultry sausage. Amazing! I used a pound of ground beef and no sausage. Only 1 tbsp of olive oil was necessary. Added extra garlic and onion and a 28oz can of diced tomatoes. Served over spaghetti squash. Wow!! This was delicious. I used a high ratio of sauce to pasta because this is loaded with vegetables. My new favorite pasta sauce. Followed the recipe exactly. Very easy and very tasty. This is definitely a keeper!